A nice SWB with all the toys and respectable horsepower. Red and black leather interior. A bargain at £3495. Now available to view at MJP - call 01277 374201. Now available to view at MJP - call 01277 374201. 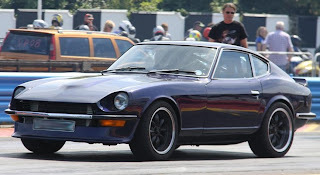 The Z Club Drag Challenge rose to a new high at Shakespeare County Raceway this month when we ran an all Z eight car Bracket Eliminator for the first time ever in the U.K. Competitors posted their dial-in times and then ran to advantage or handicap on the tree against their opposition. Winner on the day was Steve Kiddell in his injected twelve second 240Z. Steve just pressurised the consistent Jon Billings in a 260Z into his first break-out of the day. A hard won final!